Trade data of African countries is based on shipping details collected from various sources when a cargo enters into and departs from ports of various African nations. Here are some more facts about African countries shipment data. Ethiopia import export data covers both Ethiopian and foreign companies. It contains detailed information about country’s importing and exporting activities that is helpful in global trade. 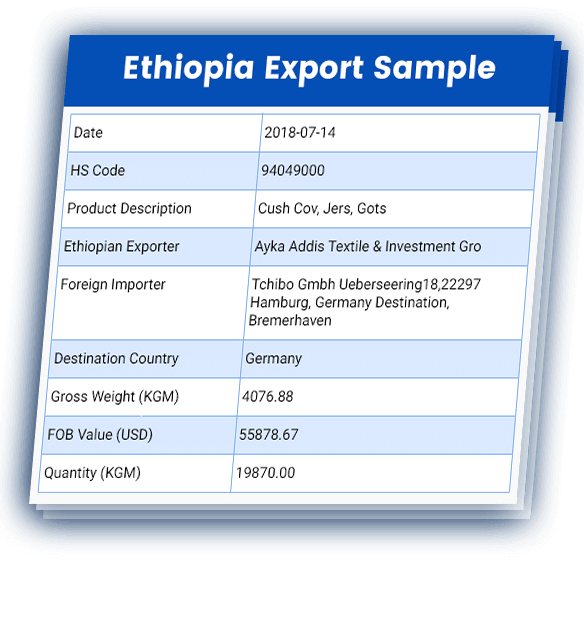 Here is Ethiopia export sample for understanding data columns. 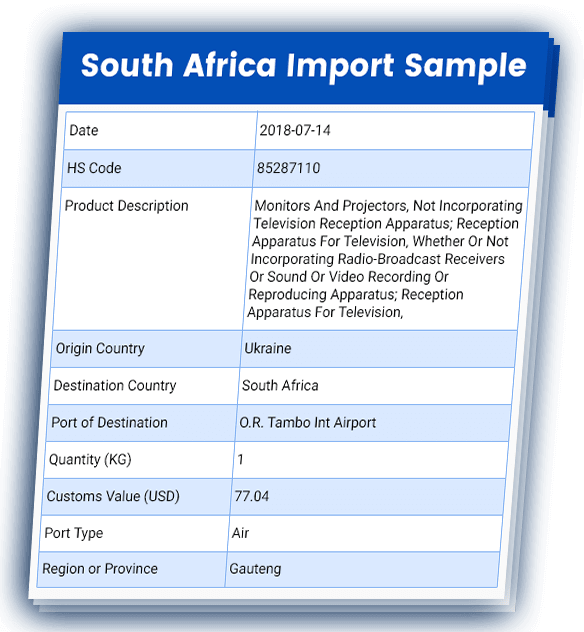 South Africa import export data is based on customs details that are collected when consignments get entered into and departed from the country. Let’s take a look at columns available in trade data of South Africa from import sample given here. 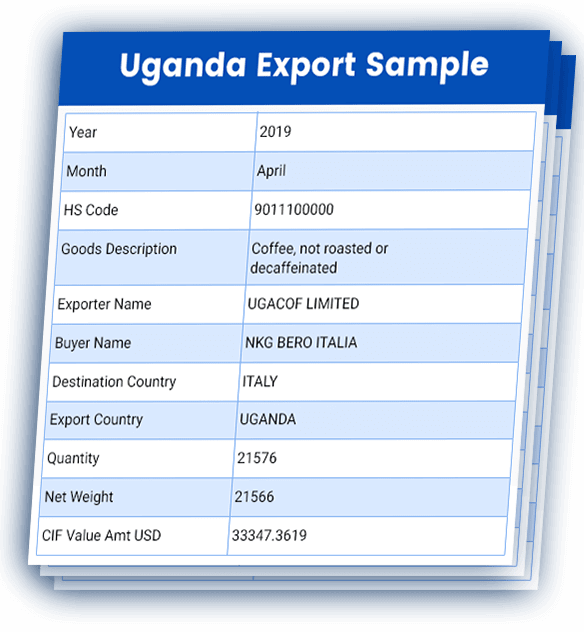 Uganda import export data is a collection of statistics based on customs information. It covers one side party trade information i.e. Ugandan companies only. Here is export sample of Uganda to know which fields are covered in data. As per African countries trade statistics, total imports valued at US$ 481 billion and total exports valued at US$ 463 billion in 2017. As we provide trade data of Ethiopia, South Africa and Uganda only in Africa, let’s check import export statistics of these countries. With the help of our import export data of African countries, financial institutions such as banks can study financial status of companies and approach them to have banking services. For Global Companies As we cover details of companies in Ethiopia only, so global companies can find their business companions in this country. And companies can also monitor shipments of their competitors and analyse the market. For Logistics Companies Our import export data of African countries is useful to logistics agencies. How? They can actually analyse shipments arriving at or departing from ports and attract customers to avail their services from particular ports. For Financial Institutions With the help of our import export data of African countries, financial institutions such as banks can study financial status of companies and approach them to have banking services. For Market Research Agencies When it comes to market research agencies, our data is useful for them to know credibility and credit ratings of companies. They can also gain knowledge about various industries to make better market forecasts. Want to Know More About African Countries Trade Data?